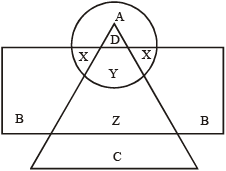 The required region is the one which is common to the circle and the triangle only i.e., D.
The required region is the one which is common to the triangle and the rectangle but lies outside the circle i.e., Z. C lies inside the triangle only. So, C represents surgical Specialists. B lies inside the rectangle only. So, B represents Medical Specialists who are neither Professors nor surgical Specialists. The required region is the one which is common to the triangle and the circle but lies outside the square i.e., X. Directions (Q. 6-10) : Answer these questions based on the diagram given below. 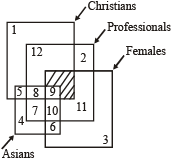 Asian Non-Christian females who are professionals are represented by the common figure of all square except Christians’ square i.e., 10. Asian females who are neither professional nor Christian are denoted by the common figure of Asians square and Females square i.e., 6. Non-Asian professional Christian male are represented by the common figure of christian’s square and professional square i.e., 12. Christian females who are Non-professional and Asian are represented by the common figure of all squares except professionals square. But no any figure belongs in these three squares. The shaded portion is the common portion of all square except Asians. Directions (Q. 11-14) : In the following figure, the smaller triangle represents teachers; the big triangle represents politicians; circle represents graduates and rectangle represents members of Parliament. Different regions are being represented by letters of English alphabet. Which among the following regions represent the graduates or teachers but not politicians? The persons satisfying the given conditions are denoted by regions which lie inside the smaller triangle or the circle but outside the bigger triangle i.e. A and E.
Which among the following regions represent the graduate politicians but not the members of Parliament? 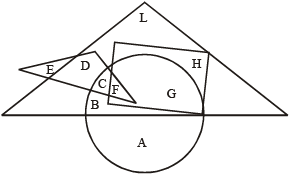 The person satisfying the given conditions are represented by regions which are common to the bigger triangle and the circle but lies outside the rectangle i.e. B and C.
Which among the following regions represent the politicians, who are neither teachers nor graduates? The persons satisfying the given conditions are represented by regions which lie inside the bigger triangle but outside the smaller triangle and the circle i.e. L and H.
Which among the following regions represent the members of parliament, who are graduate as well as a teacher? The person satisfying the given conditions is represented by the region common to the rectangle, circle and the smaller triangle i.e. F.
Which area is cultivated by all the four commodities? The required region is the one common to the rectangle, square, circle and the triangle i.e. 7. Which area is cultivated by wheat and maize only? The required region is the one which is common to only the rectangle and the circle and is not a part of either the triangle or the square i.e. 4. Which area is cultivated by rice only? 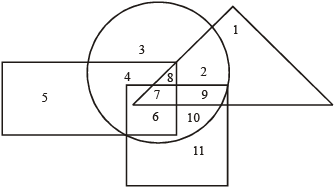 The required region is the one which lies inside the triangle and outside the rectangle, square and circle i.e.1. Which area is cultivated by maize only? The required region is the one which lies inside the circle but outside the rectangle, square and triangle i.e. 3. Which area is cultivated by rice and maize and nothing else? The required region is the one which is common to only the triangle and the circle i.e. 2. Directions : (Qs.20-24) : In the following diagram, three classes of population are represented by three figures. The triangle represents the school teachers, the square represents the married persons and the circle represents the persons living in joint families. Married persons living in joint families are presented by the region common to the square and the circle i.e., D and B. But, according to the conditions, the persons should not be school teachers. So, B is to be excluded . Hence, the required condition is denoted by region D.
Persons living in joint families are represented by the circle. According to the given conditions, the persons should be unmarried and not working as school teachers. So, the region should not be a part of either the square of the triangle. Thus, the given conditions are satisfied by the region E.
Married teachers are represented by the region common to the square and the triangle i. e. ,B and C. But, according to the given conditions, the persons should be living in joint families. So, the required region should be a part of the circle .Since B lies inside the circle, so the given conditions are satisfied by the persons denoted by the region B. As in the above question, married teachers are represented by B and C. But, here, the given conditions lay down that the persons should not be living in joint families. So, the required region should lie outside the circle. Since C lies outside the circle, so the given conditions are satisfied by the persons denoted by the region C.
School teachers are represented by the triangle. But according to the given conditions, persons are neither married nor do they live in joint families .So, the region should not be a part of either of either the square or the circle. Such region is F. Hence, the answer is (a). ∴ Required number = (13 + 13 + 18 + 18) = 62. The required set of students is denoted by regions lying inside the circles representing History, Mathematics and Science. ∴ Required number = (9 + 14 + 18 + 15 + 16 + 13 + 13 + 20 + 18 + 13 + 16 + 19) = 183. 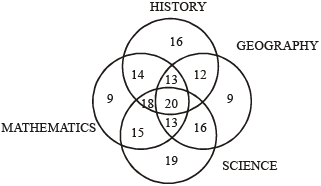 The required set of students is denoted by the regions common to the circles representing History and Geography. ∴ Required number = (20 + 13 + 12 + 18) = 63. Which subject was taken by the largest number of students? Number of students who took History = (16 + 12 + 18 + 20 + 18 + 14 + 13) = 111. Number of students who took Geography = (9 + 16 + 13 + 20 + 13 + 12 + 18) = 101. Number of students who took science = (19 + 15 + 18 + 20 + 18 + 16 + 13) = 119. Number of students who took mathematics = (9 + 14 + 13 + 20 + 13 + 15 + 18) = 102. The required region is the region which is common to the triangle and square but lies outside the circle i.e. B. If Tall men is equivalent to circle, Army men to triangle and Strong men to square. In figure, different regions are represented by different numbers from 1 to 7. Indicate which number will represent strong army men? Strong army men will be represented by the region which is common to the square and the triangle i.e., 4, 7. The diagram below represents the students who study Physics, Chemistry and Mathematics. Study the diagram and identify the region which represents the students who study Physics and Mathematics but not Chemistry. The required region is the one which is common to circles X and Z but lies outside the circle Y i.e. T.